Coll. No. 1258, 26 Jul 2015, characters observed: Perennial, to 40 cm. ; Stem, spreading hairy, glandular; Leaves, cauline, alternate, 33 mm. × 9 mm. wide, oblong, margin entire, tip acute, appressed hairy; Peduncle, 15 mm. ; Bracts, leafy, 10-16 mm. × 2.5 mm., lanceolate, some exceeding heads by 4-7 mm. ; Involucre, 9 mm. × 14 mm. wide; Phyllaries, in 4+ graduated series, 4-9 mm. × 1 mm. 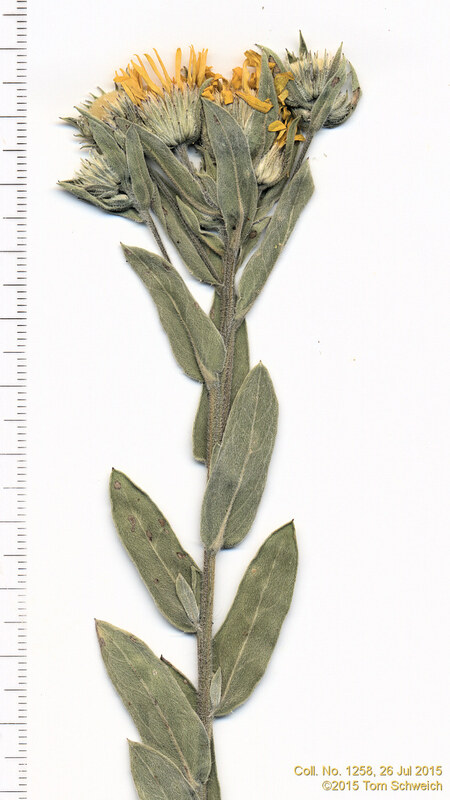 wide, lanceolate, slightly keeled proximally, mostly green, abaxial surface glandular and hairy, margin hairy; Receptacle, epaleate, short (0.5 mm.) scales; Flowers, 2 kinds; Rays, sterile, corolla, 11 mm., yellow; Disk flowers, corolla, 7 mm., yellow; Pappus, short (0.6 mm.) and long (6 mm.) bristles, ≥disk corolla; cypsela, 1.3 mm., hairy. Field Notes: Coll. No. 1258, 26 Jul 2015. Other photos about Species - Asteraceae or Heterotheca foliosa.